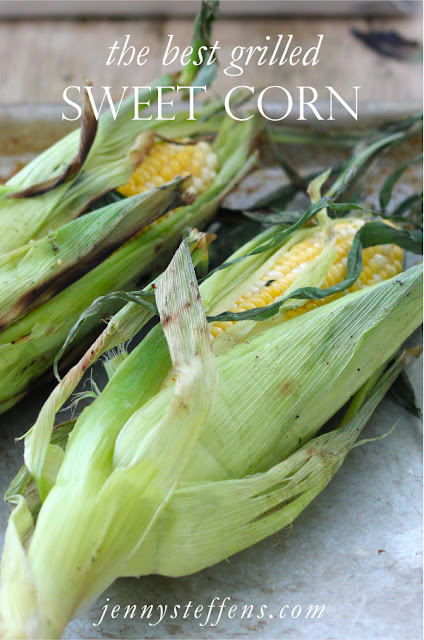 Is there anything better than sweet corn? Here in Massachusetts the season is toward the end of July to August, but back home in Kansas City sweet corn is perfectly timed (most years...) for the 4th of July. For years, my sister and I would sell sweet corn from our front yard that we had picked and shucked ourselves... similar to a lemonade stand, but people would actually stop. We spent many summer days under a tree in our backyard with my Mom, Nancy and Granny while we shucked corn to "put up." Pops (my grandpa) talks about eating 10-12 ears in one sitting when he was a boy. At home, it seems that there is a fondness surrounding sweet corn- maybe it is the simplicity of being able to grow something that is perfect in its most basic form? Or maybe that it always feels like the official start of Summer, just as "mushroom season" (morels) is the official start of Spring? I'll admit, this "Grilled Sweet Corn" is not how we prepare corn at home, but it is a great shortcut for me to throw it on the grill with the rest of dinner instead of heating up a big pot of boiling water on a hot day. And it is delicious. Begin by pulling back the husks, but do not remove them. Remove all of the silk from the corn and husk. Soak them in water for 10 minutes. Remove from the water then brush the melted butter on the corn and then sprinkle with salt. Pull the husks back over the corn. Place them on a grill for 15 minutes to 25 minutes, depending on the corn and the heat of the grill. If you need a little inspiration, here is a great summer meal with Sliced Flank Steak with a Chimichurri Sauce, slice heirloom tomatoes and avocados. This meal looks fantastic-i love chimchurri sauce on meat!! I must try it sometime, thank you! A staple at the Indiana State Fair. The season is getting ready to start soon here in Indiana, and you can bet Ill be grilling away too! mix some chili powder with the butter and get a big burst of extra flavor in every bite. I've always wanted to grill corn on the cob to get that extra bit of flavor but I'm curious...how do you know when it is done?